Communication towers are considered the highways of the sky and are responsible for transporting vast amounts of data and cellular connectivity to individuals and businesses below. Similar to our road system they require an inspection periodically to ensure traffic is flowing smoothly and repair any deficiencies before the network goes down. A number of organizations are unaware of the current state of their tower infrastructure and have dated information that could potentially become a hazard. According to CSA-Standard-S37 -13 it is “recommended that all antenna-supporting structures should be given a detailed inspection by a professional engineer or a qualified technician at intervals not exceeding four years for guyed structures and six years for self-supporting structures”. 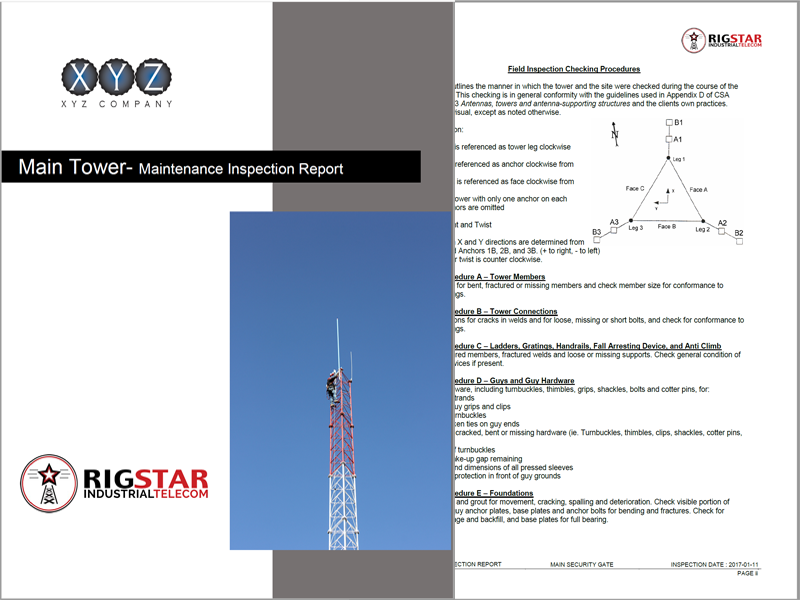 Rigstar is able to provide a detailed inspection of any guyed or self-support tower. Our team has over 50 years of combined experience with constructing, inspecting and maintaining communication towers. Each inspection involves a detailed process that documents the current health of the tower and a list of deficiencies. Our riggers will repair any minor deficiencies as they complete the inspection and provide a catalogue of high res images, along with the option of a drone video. Rigstar will also provide a complimentary one-year subscription to our Tower Management Software that allows any organization to access all of their tower infrastructure and inspection reports through one login portal.